My dear MsBlake flew all the way down to join me for a lovely evening of Castle and French food. I'll explain the Castle part later. Let's do this out of order, shall we? For someone as sophisticated as MsBlake, only the best will do, so we headed to our local Thomas Keller establishment -- Bouchon in Beverly Hills. Yes, I just posted about brunch at the Vegas outpost. 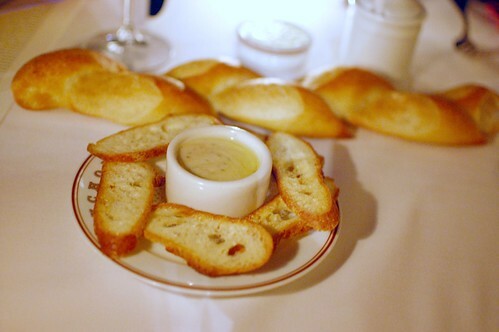 I doubt I'll ever tire of Bouchon. Now, I normally don't visit a place like this without a reservation, but we didn't know when the Castle portion of our night would conclude. I figured we'd be fine walking in after 9. I was right. Sort of. We arrived at Bouchon around 9:30. 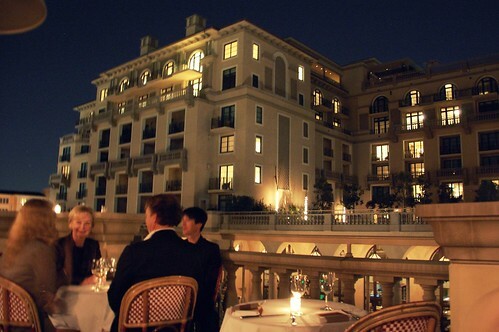 There were no open tables in the main dining room, so we were seated on the beautiful balcony -- extraordinarily romantic with flickering intimate candlelight under the starry sky. It felt like we were on an incredible date somewhere in Europe. Perfect for lovers. Horrible for bloggers. Ha! 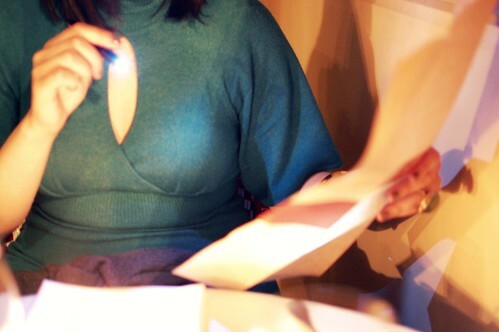 'Twas so dark that our server gave MsBlake a tiny flashlight to peruse the menu. 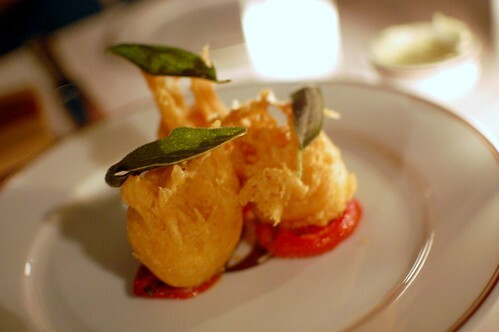 Light, gloriously fried, and filled with amazing, flavorful, flaky salt cod. My favorite bites of the night. When I think of these, I sigh. That good, people. That good. 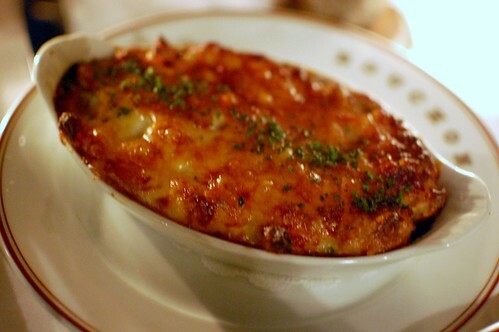 Macaroni au gratin -- macaroni and cheese ($7.50). Not bad but definitely over-zealous with the browning of the cheese on top. Moules au safran maine -- bouchot mussels steamed with white wine, mustard, and saffron served with French fries ($28.50). Ok, so these are just the French fries. If you're really dying to see some mussels, you can take a look at Mr. Monkey's dish during our dinner at the Vegas location. 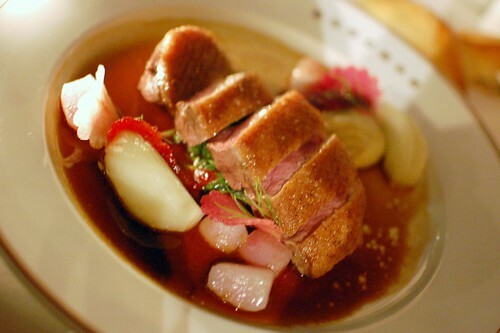 Magret de canard -- herb-roasted duck breast with fennel bulb, citrus confit, red radish, mizuna, and duck jus ($36.00). You know I always order duck if it's on the menu. This night was no exception. Was it the best I've ever had? By no means. Did I enjoy it? Hell yeah. Tarte au citron -- lemon tart ($9.50). So tart, this tarte! We were so stuffed that I took most of it home. Mr. Monkey gobbled it up with gusto the next day. 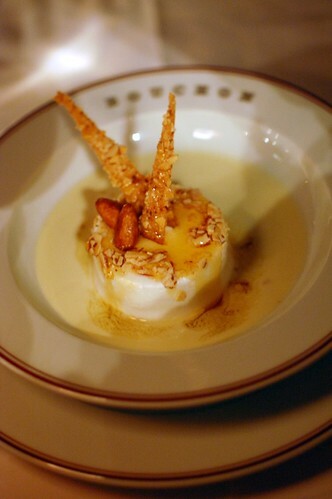 Ile flottante -- meringue with vanilla creme anglaise, almond, and caramel ($9.00). A floating island, indeed. Dreamy. 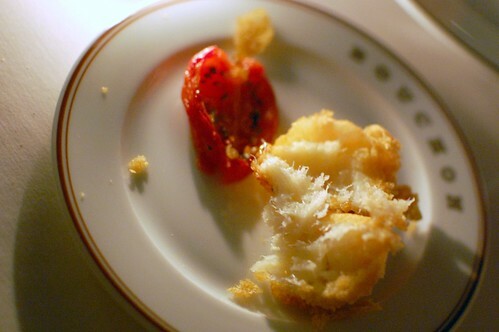 I'm not big on sweets, but this dessert gave my beloved fried cod a run for its money. Light and airy. Cloud-like. Other-wordly texture. So enamored with this. 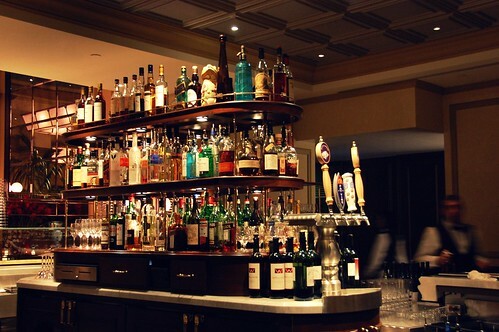 Enamored with the look of the bar, too. Sort of an old-school feel. 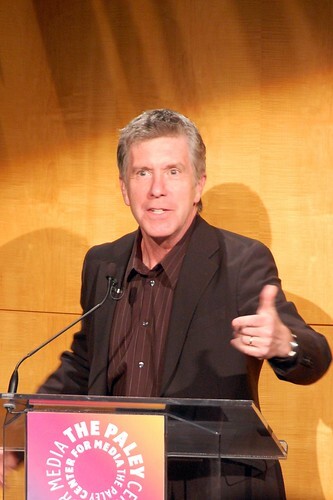 This enchanted evening started at the nearby Paley Center, where we watched a yet-to-be-aired episode of Castle and listened to a session with the cast, writers, directors, and producers moderated by Tom Bergeron, host of Dancing With the Stars. The episode screened was quite the cliffhanger. MsBlake was thrilled not only to have experienced this sneak peek, but she was giddy to have gotten a live glimpse of one of her fashion icons, Stana Katic, who plays Detective Kate Beckett. She is beautiful, no? I love how she looked right at me as I took this photo. A captivating evening from start to finish -- thank you, MsBlake! This is so great. I just died a little from jealousy. Yay! That was such a truly fantastic night from start to finish. I had the best time. The photos look great. Can't wait to do it again. What a beautiful location for dinner. And you got to meet the famous MsBlake! 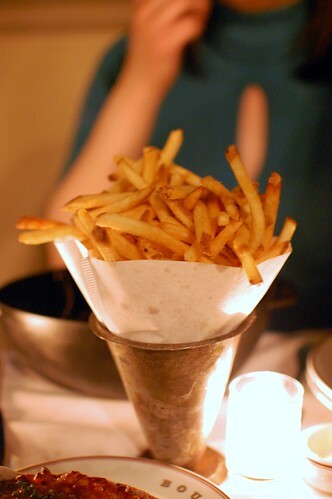 bouchon still has the best fries ever. sounds like a wonderful night you had there. Great pics of the actors as well, you are so good at celebrity shots! Those Beignets de brandade de morue look amazing!! 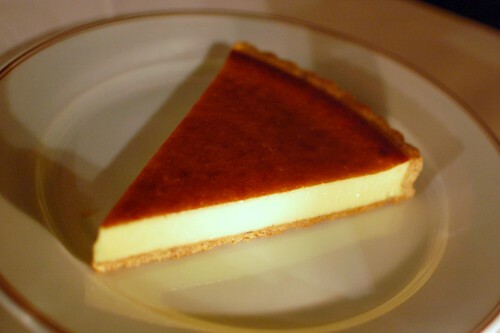 And that lemon tart looks fake, it's so perfect. Yum yum! the bear and i so need to do a romantic evening on that balcony. bouchon...hee hee hee honh honh honh! Have you tried the Bakery's macarons? Delish! Weeeeez, we have something in common! If duck is on a menu, I have to order it too! High five! 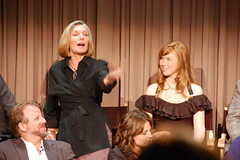 Looks amazing, and how cool you got to see the Castle cast! That romantic balcony definitely looks like it's straight out of Europe. 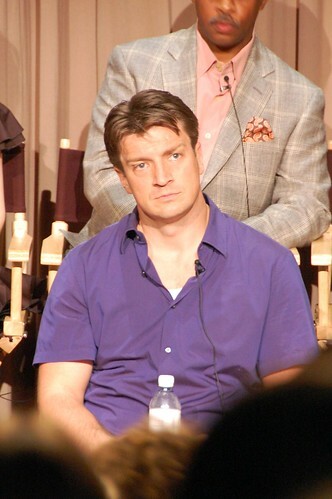 When I was on my cruise, there was a guy in the hot tub with me who knew Nathan Fillion (sp?) and was going on and on and on about what a jerk and a d-bag he was. This is the ONLY thing I know about this guy, but I doubt I will ever forget it. please pass those beignets my way. please, oh please. Wow, you're right, this balcony has a very romantic feel to it. I, too, love to order duck when I'm at a restaurant. Definitely adding this to my list of date night ideas. Fun night!! 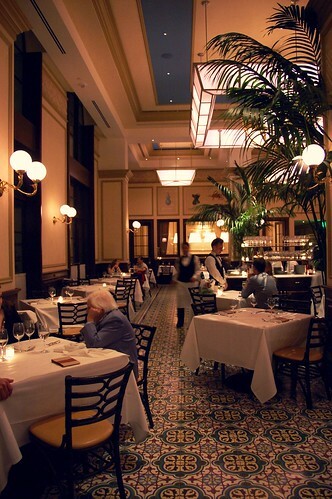 I was really hoping Bouchon BH had a brunch menu as I wanted to take my mom there this week. Unfortunately, they don't. Phooey.